After the first 2012 national record of a Speckled Wood in the garden on 13 January (Phenology: early record of Speckled Wood butterfly) things have quietened down a little. 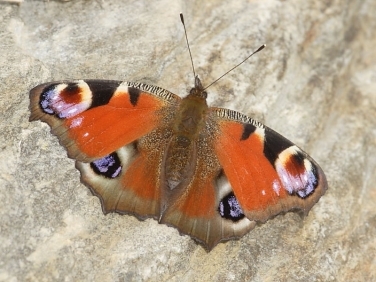 However, a few Peacock butterflies have emerged from hibernation in the last two weeks. It was interesting to see one of these stunning butterflies during a walk around the cliffs at Rosemullion Head between Falmouth and the Helford estuary. It was sunning itself on the eroded cliff face in exactly the same spot that we’d seen one on 10 September last year (Cornwall butterflies: Peacock posted on 12 September). Maybe, it was the same individual that had successfully hibernated through the winter. If so, it was understandably looking a little bit worn in comparison to its fine condition of September as shown.